The president said it's not fair to American taxpayers that Germany buys energy from Russia while enjoying the umbrella of defense provided by U.S. cash. BRUSSELS — President Donald Trump called Germany "a captive of Russia" and pressed NATO allies to double their commitment to defense spending Wednesday during a momentous opening to a two-day summit here. 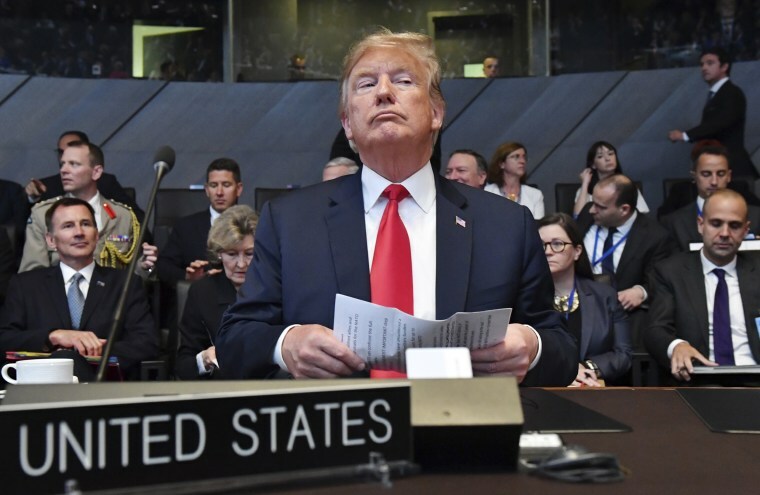 Trump had already harshly criticized North Atlantic Treaty Organization nations that have failed to hit a target of spending 2 percent of their gross domestic products on defense. On Wednesday, he upped the ante. "During the president's remarks today at the NATO summit he suggested that countries not only meet their commitment of 2 percent of their GDP on defense spending, but that they increase it to 4 percent," White House Press Secretary Sarah Sanders said. "President Trump wants to see our allies share more of the burden and at a very minimum meet their already stated obligations." But it was his scorn for Germany, expressed hours before the summit's official opening and amid domestic political turmoil for Chancellor Angela Merkel, that first grabbed the attention of America's closest allies. Trump said it is not fair to American taxpayers that Germany buys oil and gas from Russia while enjoying the umbrella of defense provided by U.S. dollars. "Germany is a captive of Russia," he said, pointing out that the country pays "billions and billions of dollars" to Russia for energy. Trump highlighted that "Germany is a rich country" and asked why the U.S. should "protect you against Russia" when the two countries are making deals. "You tell me, is that appropriate?" he asked, adding that "Germany is totally controlled by Russia." In brief remarks to reporters outside the NATO conference, Merkel asserted that Germany is independent from Russia and contributes to the mutual defense of its member nations, and added that she was prepared to have "controversial" discussions. Merkel, who was raised behind the Soviet Union's Iron Curtain in East Germany, also noted pointedly that unified Germany is now free from the yoke of Moscow. Trump's harsh words for the longtime U.S. ally are part of a larger broadside against European nations that the president says are taking advantage of America. His criticism of Germany signaled that he has no intention of easing pressure on alliance nations just because Europe is nervous that tensions could empower Russian President Vladimir Putin, with whom Trump is scheduled to meet Monday in Helsinki. German Defense Minister Ursula von der Leyen said later Wednesday that she didn't "really understand what he means" by saying her nation is "captive" to Russia. "We have a lot of issues with Russia, without any doubt, but on the other hand you should keep a communication line between countries or alliances and opponents without any question," she said. "So I'm curious to listen in-depth in the meeting what the American president is meaning by that." Merkel and Trump, who arrived at the NATO summit via a different entrance than the other world leaders, met privately about 9:15 a.m. ET. The two leaders discussed the pipeline, Trump said when they broke to chat with reporters. He did not elaborate. The meeting was "great" and he has a "very, very good relationship" with Merkel, Trump said. Speaking in German, Merkel said they discussed trade and migration. Later, Trump held a similar sitdown with French President Emmanuel Macron. After their meeting, Macron was asked if he agreed that Merkel is beholden to Russia. Trump jokingly interjected that he was glad the question had been posed to the French president. Macron deflected, saying he and Trump discussed NATO cooperation. Trump didn't give NATO allies much time to get settled. His fusillade was delivered even before the pomp-filled welcoming ceremony opened the NATO summit, as he and NATO Secretary General Jens Stoltenberg spoke to reporters before having breakfast together. While Stoltenberg said a "strong NATO is good for Europe and good for the United States," he tried to temper Trump's criticism of partner nations. “We have all been able to unite around our core values, that we are all stronger together than apart,” he said. “How can you be stronger when a country is getting energy from the person you want to protect against?” the president asked. “Because we understand when we stand together we are stronger,” Stoltenberg explained. Trump replied, "No, you are just making Russia richer." The president's comments appeared to be a reference to the Nord Stream 2 pipeline, which would bring gas from Russia to Germany's northeastern Baltic coast, bypassing Eastern European nations like Poland and Ukraine and doubling the amount of gas Russia can send directly to Germany. The vast undersea pipeline is opposed by the U.S. and some other E.U. members, who warn it could give Moscow greater leverage over Western Europe. Earlier, Trump said that he had "great confidence" in Stoltenberg, and gave him credit for working to deal with the "unfair burden" he said was being footed by the U.S. The line of argument is nothing new for Trump: It's been his most consistent criticism of traditional American allies and one that he made both at a campaign rally in Montana last week and in Washington just before he departed for his trip to Europe. But the message landed differently — a little more directly — now that he is in Brussels and meeting face-to-face with the leaders of NATO nations. Trump has turned decades of American diplomacy on its head, former U.S. ambassador to NATO Nicholas Burns said Wednesday on MSNBC's "Morning Joe." "It's just infuriating to watch this happen," Burns said. "You cannot imagine any American president all the way back 75 years deciding to become the critic-in-chief of NATO. I mean, it's Orwellian. He's making our friends out to be our enemies and he’s treating our enemies, like Putin, as our friends." In a joint statement issued Wednesday, the top two Democrats in Congress, Senate Minority Leader Chuck Schumer of New York and House Minority Leader Nancy Pelosi of California, said Trump's behavior at NATO sent a "profoundly disturbing signal" that he is "more loyal to President Putin" than the alliance. "If the president leaves the Putin meeting without ironclad assurances and concrete steps toward a full cessation of Russian attacks on our democracy, this meeting will not only be a failure — it will be a grave step backward for the future of the international order and global security," they said. While Trump didn't mention Merkel by name in his remarks early Wednesday, they clashed at last month's G-7 summit, and he later took a swipe at her on Twitter — wrongly stating that crime was rising in her country because of mass migration. He also referred to Merkel at the Montana event, saying, "I don’t know how much protection we get by protecting you." The president's ambassador to NATO, former Texas Sen. Kay Bailey Hutchison, said last week that the goal of the summit is to project unity. But Trump's demands, and his criticism of Germany, threaten that outcome. Laura Rosenberger, a senior fellow at the German Marshall Fund and a foreign policy adviser to Hillary Clinton's 2016 campaign, told NBC News that Trump is only helping Russia by exposing and creating fissures within NATO. "While concerns about Nord Stream 2 are real, accusing Germany of being captive to Russia is patently false — and frankly feels like a bit of projection coming from Trump," Rosenberger said. "But more broadly, the fact that he chose to start off the summit’s events by attacking one of our allies, instead of stressing our unity ... is itself a win for Putin." At the end of the day, the NATO heads of state released a 79-point joint declaration that mentioned Russia 56 times, and Stoltenberg said a Wednesday night dinner would focus on Russia. But he demurred when asked about Trump's request that countries reach a new target of spending 4 percent of the size of their individual economies on defense. "Well, I will focus on what we have agreed, and we have agreed to be committed to the pledge increasing defense spending to 2 percent, and let’s start with that," he said. "So we have a way to go, but the good news is we’ve really started to deliver." Tony Brown and Associated Press contributed.